Phenomenological accounts of sociality in Husserl, Heidegger, Merleau-Ponty, Sartre, Scheler, Schütz, Stein and many others offer powerful lines of arguments to recast current, predominantly analytic, discussions on collective intentionality and social cognition. Against this background, the aim of this volume is to reevaluate, critically and in contemporary terms, the rich phenomenological resources regarding social reality: the interpersonal, collective and communal aspects of the life-world (Lebenswelt). Specifically, the book pursues three interrelated objectives: it aims 1.) to systematically explore the key phenomenological aspects of social reality; 2.) to offer novel, state-of-the-art assessments of both central and lesser-known proponents of the phenomenology of sociality (Gurwitsch, Löwith, von Hildebrand, or Walther), and 3.) to contextualize this elaborate body of work in light of contemporary social cognition research, the growing literature in analytic social ontology, and current trends in moral psychology, moral phenomenology, and social and political philosophy. The collection brings together original articles by a host of prominent scholars and upcoming young talents to provide a comprehensive and up-to-date treatment of the topic. 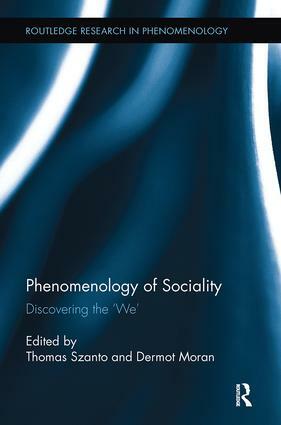 It will be essential reading for those studying phenomenological accounts of intersubjectivity, empathy, and community, including analytic, social, moral and political philosophers, and will also be of interest for social scientists and social psychologists. Thomas Szanto is a Postdoctoral Research Fellow at the Center for Subjectivity Research (CFS), at the University of Copenhagen, Denmark. Dermot Moran is Professor of Philosophy at University College Dublin, Ireland and Sir Walter Murdoch Adjunct Professor in the Humanitires, Murdoch University, Australia.